Abstract: A passivity-based model-free control scheme for underwater fully actuated vehicle-manipulator system (UVMS) in contact tasks is proposed. 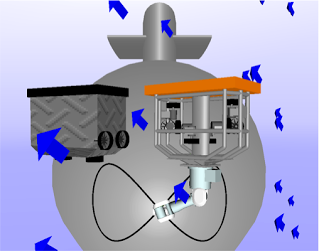 An orthogonalized motion and force second order sliding modes are enforced for all time for the redundant noninertial robotic UVMS, including when it is subject to a class of fluid disturbances. To this end, we first determine the constrained dynamics using the quasi-Lagrangian formulation to explicitly characterize hydrodynamic fluid per- turbations. Our scheme aims at exploiting structural properties of Lagrangian systems, then we derive a mapping between the quasi-Lagrangian UVMS to its equivalent Lagrangian form and study the conditions for open-loop passivity preservation during the interaction of postures and contact constraints between the end-effector of the UVMS and the rigid contact surface of bulky objects in cluttered submarine environments. Internal motions are simultaneously computed by solving, in the tangent subspace of the contact manifold, a hierarchy of secondary tasks to satisfy posture constraints. More importantly, the solution shapes the extended errors used to preserve passivity and to enforce dissipatedness so as to guarantee local exponential stability without any knowledge of the complex UVMS dynamics and the energetic performance of the UVMS in closed-loop. Illustrative simulations are discussed to show the feasibility of the proposed scheme.